DISCLAIMER-NO RECIPE! SORRY! As you know I am pretty enamored with potatoes. Hell, that's putting it pretty mildly! I love them! I have eaten white potatoes 4-5 times a week every week for the last year and have completely reversed diabetes in the process. For those of you with some interest in potatoes and the ability to read more than a paragraph in one sitting (ummm sometimes I can't so don't feel bad, guess its all the video games over the years) I would like to share a wonderfully in depth article by registered dietitian and funny man Jeff Novick on potatoes and their correlation with Type 2 Diabetes. Are potatoes dangerous? 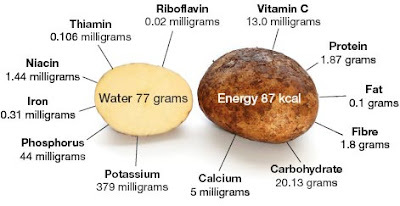 Do potatoes cause diabetes?